Unleashed Technologies hosted a webinar on June 28th, 2018 at 1pm EST titled "What Are User Journeys, What Is User Mapping And Why Should I Care?" featuring Chad Hester, Senior Solutions Architect. Unleashed Technologies is honored to announce that we have been recognized as Baltimore’s top-rated firm for Drupal Developers, Web Designers, Web Developers and Digital Design in 2018 by Clutch.co. 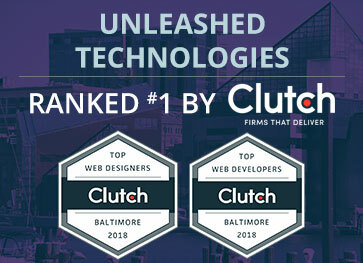 This marks the third consecutive year that Unleashed Technologies has been ranked as Baltimore’s Top Drupal Development firm and the second consecutive year of recognition as Baltimore’s Top Web Developers and Designers by Clutch.co. Clutch.co, an independent research firm based in the nation’s capital, recently announced its annual ranking of B2B services companies in Washington, D.C. Unleashed Technologies is proud to have been recognized as the number one rated firm for the second consecutive year in the Web Developers, Drupal Developers, and PHP Developers categories. Additionally, Unleashed Technologies was selected as a top performer in the Web Designers, Digital Design, and WordPress Developers categories. Unleashed Technologies hosted a webinar on web personalization on May 24th, 2018 at 1pm EST. The webinar titled "Personalization for Associations: Creating a Seamless Digital Experience For Your Members" featured Chris Jorgenson, Director of Marketing at Unleashed Technologies, and Jason Currier, Director Nonprofits Mid-Atlantic, from Acquia. Unleashed Technologies hosted a webinar on voice technology on April 26th, 2018 at 1pm EST. The webinar titled "The Future of Voice Technology" featured Chris Forhan and Colin O'Dell from the Unleashed Technologies team.